M416 DATA PLATE SET NOS. 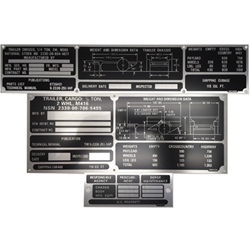 DATA PLATE SET, SERIAL NUMBER, DIMENSION PLATE & RESPONSIBILITY AGENCY. ALL NOS. TWO PLATES GO ON THE REAR PANEL AND ONE ON THE RIGHT HAND FRAME RAIL. LIMITED QTY.